Friday’s game was in Goodyear which is the Reds stadium. We had never been there. We decided to do a little shopping before we left for Goodyear. There are some very nice shops in Glendale. They do open late and close early so we had missed most of the shops the last time we had visited. We stopped at a candy store. Delicious chocolates. They actually make their candy right there on the premises. A little pricey but worth it. Downtown Glendale is very quaint with antique stores, mostly mom and pop type stores all worth just taking a look. We stopped to get our favorite Dodger ice cream. They had had a contest a few years ago and this was the winning combination. It’s become a tradition to go back and get a cone every year. We decided to eat at the stadium since it was getting late. Goodyear is not our favorite stadium. It was our first time there and were disappointed. The rows were long so it was hard to get in and out of your seat. There was nonexistent security and they seemed to be at the gates and not in the stadium itself. The crowd was large since it was a sellout crowd so of course there were a few fans who were drunk and unruly. We won’t go back again. When we finally got through the gates, I hurried down to the dugout in hopes of seeing some of my guys. It was nice to see Jon SooHoo, the Dodger photographer. Hi Jon!! And there was Alanna Rizzo who is always nice to the fans. She asked me where I was all spring. Always fun to look in the dugout. I happened to see Russell Martin. He waved at me and said hi. I asked him if he remembered me. It’s been 11 years since I’ve seen him. He said he did. It was nice of him to say that although I don’t know if he really did. There’s Travis and the other trainers. And worse yet to see Matt not in blue. I left my seat to get something to eat. The lines were so long I decided to get into the shortest line, the hamburger line. I wasn’t disappointed. It was one of the best hamburgers I have ever had. It was a Hatch chile, jack cheese hamburger fully loaded. i savored every bite. It was messy of course. Every good hamburger is. Russell. At least I think it is. The next morning I decided to go to practice even though I was leaving that day for home. It was a gorgeous day. It had been cold but that morning, it was perfect. Kenta stopped and signed for the kids. So nice. We were impressed with Dustin May who stopped and signed many many balls for the fans. I was a little stressed since I had to catch my hotel shuttle to get back so I could get to the airport on time. They were holding everyone behind the fence until Dustin was done signing and he kept signing. Ready and waiting. Always just carry-on. I did not get a single autograph and only a couple of selfies. However it was a great trip. The airport was nerve wracking however. They confiscated the sealed yogurt from my lunch bag. I decided to throw away the peanuts since they are shaped like explosives. They didn’t particularly like the bananas either. I might have to pay extra just to get TSA precheck since all this was more stressful than it needed to be. It costs a lot for one trip a year but I think it will be worth it. If anyone asks me again if I am over 75, I’ll lie down and die for them. No no no. My luck. On the way back I literally sat next to the flight attendant. I had to make sure I had my seat belt fastened and that I turned all my electronics off. At least the taxi ride home was less than $20. The trip to the airport by an unscrupulous taxi driver was almost $30. I was fit to be tied..I was so angry. My sister asked me if I gave him a tip and I said of course not. She knows I ALWAYS leave a tip but not this one time. Opening Day is less than one week away. Norma and I will be sitting in the dugout seats I won on Fan Appreciation Day. Lucky us. I gave my season seat to my baby sister Sara. I told her to eat a lot and get my money’s worth. I had just given the Dodgers a big chunk of money for those season tickets. It’s worth every penny to me. A belated happy birthday to Norma’s Dad, here pictured with Brandi. Isn’t he a handsome guy?? Happy St Patricks Day birthday to my son’s oldest Caitie. Get well soon to my sister’s child Kitty, here with best veterinarian on earth Norma at Bay Cities Pet Hospital in Torrance. Anyone with a cat or dog needs to check this wonderful place out. So much TLC. Poppy…just because she’s my cute baby. Thanks for stopping by. Exhibition game against the Angels is coming up on Tuesday. Opening Day is Thursday. It’s baseball season again!!! GO DODGERS!!! I just returned from Spring Training yesterday and am still exhilarated from the experience. I wasn’t planning on going this year because I was still reeling from their trade to the Cincinnati Reds: gone are Matt Kemp, Alex Wood, Yasiel Puig and Kyle Farmer. I decided to go because I enjoy the company of my friends. I was definitely glad I did decide to go. I met my favorite humans there: Donna, Greg and Norma. We spent most of the time together except sleep time. I stayed at Comfort Suites as I usually do every year. I think it’s the best hotel as far as price and amenities. There is free breakfast which all the other hotels have. There is also a free shuttle to within 7 miles radius. That’s more than the other hotels offer. I have gotten rides to and from Camelback Stadium, to and from Westgate, to Residence Inn Marriott where my friends were staying. If I were to add up taxi fees and/or rental car, it would add up to an exhorbitant price. I used the shuttle at least 10 times during my 4 day stay. The rooms are comfortable and clean. The staff is friendly and very accommodating. My flight arrived about 1 hour before game time. I always take Super Shuttle from Phoenix Sky Harbor Airport. They are dependable and are always on time. I arrived back at the hotel in time to see most of the game. I had bought my ticket on StubHub for about $30 and had an amazing seat by the Dodger dugout. It was a sold out game and it was pretty cold, around 52 degrees. Very unusual for Arizona in March. Everyone was bundled up in blankets and hoodies. I was eager to see Russell Martin who was one of my first Dodger crushes way back about 12-13 years ago. Most of the starting lineup started to leave early so since it was so cold we also decided to leave. We went to WestGate but everything was already closing down. We wanted to try a place called Whiskey Rose but the music was blaring and everyone in there was just drinking. Johnny Rockets was closed. We ended up just stopping at Denny’s which is within walking distance of my hotel. I had chicken fried steak, fries and creamed corn. Everything was amazingly good. I was ready to rest and be ready for a big Thursday. The next morning I got up about 3:30am and couldn’t go back to sleep. Breakfast is served at 6:30am. I love the breakfast at the hotel. The breakfast staff is always nice. I’m waiting in front of the hotel for the shuttle. I got to the practice field a little before 8:30am and there already was a crowd there. It’s been hit or miss as far as when or if the guys are going to take practice. As it was only pitchers were out on the practice field. They ran out to the field and ran back in without even looking at any of the hundreds of fans lined up. When I say run, I mean they ran past everyone. Same thing in the opposite direction too. I decided to watch the catchers who were close to the clubhouse. And there was Russell far far away. It was my first glimpse of Russell in 11 years. He pretty much looked the same. And my friends arrived. We packed everything up and left. They decided to take a nap so they dropped me off. We left a little early for Peoria so we could stop at one of our favorite places: Cracker Barrel. We all decided to get one of the lunch specials: turkey with dressing. I got the fried okra as a side and was a little disappointed that it was not crunchy. Oh well. Since it was National PI day, we split the buttermilk pie with strawberries. It was delicious. The game was in Peoria against the Padres. Dino Ebel is the new 3rd base coach replacing my favorite Chris Woodward. I miss him. I saw Austin Barnes in the dugout. I called him and surprisingly he turned around and saw me. The players have been very focused and have not looked at the fans. No one was signing autographs or stopping at all. Austin waved at me and gave me a big smile. I turned around and showed him that I was wearing an Austin Barnes tee shirt. He gave me an even bigger smile and a thumbs up. It is tradition that I always wear one of his shirts or jerseys when he starts as catcher. That made my day. I can’t go long without taking a selfie even if I’m not sure who it is. The game was ready to start so I hurried back to my seat. Norma got a great shot of Cody swinging the bat and Austin. It was pretty awesome that Austin hit a 2 run homer in. They say that he has improved his offense. Apparently last season he was fighting an injury which messed up his swing. With a battery of Martin/Barnes behind the plate, we should be fine. As usual Tommy Lasorda was nice enough to take pictures with us. Love you forever Tommy. On his way out he was greeted by someone wearing a huge championship ring. Does anyone know who this is? Peoria is one of our favorite stadiums. It’s well run, plenty of security and the food is pretty good. I’ll finish up my experiences during Spring Training in another blog which I will write at the end of the week. There is less than 2 weeks until Opening Day. Who’s going??? Thanks everyone for supporting my blog. I appreciate it. I tried Medium for a blog entry but I hate change. WordPress is working with me giving me a better price than $300 to accommodate my blog. Medium is free. I actually like WordPress except it seems to crash a lot. You can see that blog entry on medium. I’ll probably stay with WordPress just because. I’ll be writing my blog more frequently since it is BASEBALL SEASON finally. Rest in piece Don Newcombe. You will be missed. Truly a gentleman and a kind person. I remember he told me he wasn’t very good at selfies. Prayers for his family. Usually for me Dodger baseball season begins with Fan Fest. I wasn’t sure if I wanted to go because I had to work the night before. For some reason it always is extremely hot. Although there were these negatives, I decided to go because we always do have fun!! The group was small this year. It was only Norma and me. The others had other plans that superseded Fan Fest. Go figure. We had prepurchased tickets to get selfies and autographs. It was not that difficult to buy these vouchers. Usually they sell out in the first few minutes. I thought that maybe fans were not that interested. The selfies were only $25 which I think is a deal and the autographs went up to $30 which I think is a little pricey. However, as usual, Fan Fest was horribly crowded. Wall to wall fans. I didn’t run into very many people I knew. Of course there were lines everywhere. BTW I’m wearing Matt Kemp’s Mothers Day hat. I looks a little big but it did keep the sun off my face. We arrived at 9:30 just as the parking gates opened. There was a huge crowd already there. First stop was the selfie line. We found out it was located at the furthest point of Fan Fest..a little bit of a trek. Kikè’s selfie vouchers were sold out within minutes. He is very popular. I actually decided to try for a Kikè selfie because he hasn’t always been very nice to me. The last time I took a selfie with him was on my birthday last year. I only get a selfie with him once every other year. Inexplicably he asked me last time “How many do you need?” I thought if I paid this time, he had to at least be decent to me. I decided I would ask him to take the selfie. For someone who takes selfies all the time, why would he actually have a finger in the shot? I told him I thought I blinked and asked him to take another shot. Good thing since I didn’t notice that big finger in the first shot. I’m sure he rolled his eyes at me. Love you Kiké. Nice fake smile. Considering I paid $25 for the selfie, it shouldn’t include a freaking finger. You can tell he wasn’t that happy. I had gotten Norma a voucher too. Their picture looks much nicer than mine since he had a less fake smile. We ran into fellow Dodger fan and good friend Cindy. She had been able to purchase a selfie and autograph with her heart throb Chris Taylor. And thank you Cindy for the delicious banana bread. We also ran into our buddy Crystal who was able to snag a Baez jersey for a mere $60!! Great job Crystal. She was kind enough to bring us Diet Cokes while we stood in the selfie line. You rock girl!! She also bought me Austin Barnes pants. Now I have a complete outfit: jerseys, hat and pants. I can come to a game totally decked out as Austin Barnes. JK. Here is Norma standing in one of the autograph lines. I chose not to purchase any vouchers for autographs since I rarely get autographs anyway. Why bother? She got vouchers for David Freese, Steve Yeager and Edwin Rios. She teasingly says that he is her cousin. I also wanted a Max Muncy selfie since he is very quiet and rarely takes pictures or signs autographs. This pic is probably my favorite of all my player selfies. What a sweetie he is! I also got vouchers for Chris Taylor selfies since he too is quiet and rarely takes pics. He always is sweet. Isn’t this a sweet pic of Chris and Norma? We were told after the Kikè selfies not to ask the player to take the selfies for us. I guess he complained. Great job Kiké. However Chris kindly pushed the button on my phone for this selfie. Thank you Chris. I have to say that the highlight of Fan Fest for me was seeing Dave Styles. Everyone knows I have a huge crush on him. I saw him very far away on the Fan Fest stage so I started to text him. I told him I was standing at the fence. I saw him looking around. He was looking at his phone. I was hoping he would wave to me since he can’t really pay attention to me when he is working. To my surprise he made his way off the stage and actually came over and talked to me. And took a series of selfies!! What a great guy he is. After a few hugs he had to go back to work. Thank you Dave!! By the time we finished with selfies and autographs, we were ready to leave. It was a very hot, tiring day but we left very happy. It was another fun Fan Fest in the books. I told Norma I would treat her to dinner. I got the biggest hamburger they had complete with onion rings and mushrooms.!! Heaven. Fan Fest is always the first taste of baseball season for Norma and me. It was well worth going. For those who have never attended, you are missing out. Next Dodger event for us will be Spring Training which is just around the corner. We will be going in March. I’m looking forward to seeing newly acquired Russell Martin and Dodger killer AJ Pollock. I still think the Dodgers got him so he wouldn’t continually mess us up. I’m not looking forward to the ugly heat of Arizona. Thanks for stopping by. This blog will be in full swing soon so please keep checking. Also thanks again for all your support over the years. I appreciate you!!! It’s the beginning of the 2019 season. Fan Fest is tomorrow. Who’s going? Amazingly there are still autograph sessions open which is unusual. It’s usually sold out in the first couple of hours. 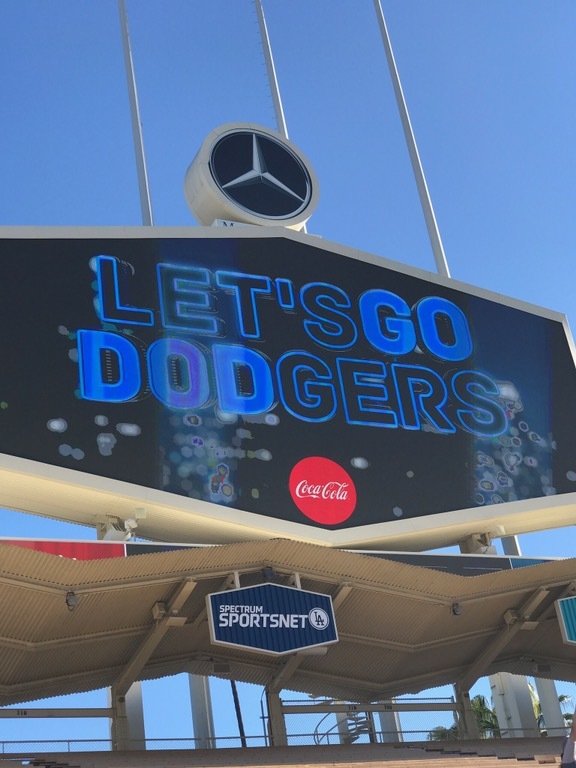 There are new events to take part in: a selfie station where you can have a selfie with a Dodger for $25. I thought I would get a ticket to get one with Kikè so he can ask me again how many I need. This time I am paying so he can’t say much. I also got tickets to take selfies with Chris Taylor and Max Muncy, the shyest Dodgers. I really didn’t think there was a need for me to get any autographs since that really isn’t my thing during the season anyway. There will also be a giant yard sale in Lot G. That should be interesting to see what junk they are trying to unload. Cash only. I wasn’t planning on going since I’m working the night before. I’m not happy with the off season trades. Matt Kemp made the season’s best comeback and then was relegated to the bench amidst grumbling that he wasn’t so good. How do they know if they never let him play? And they traded one of my favorites: Yasiel Puig, a guy with a huge heart. Does everyone know how much he did for the LA disadvantaged kids since he didn’t go all over the media with it. His very fun charity event: the poker tournament, raised money for the children and wasn’t over the top expensive to go to. He had his Wild Horse Foundation because he truly cares, not for the publicity. I will miss his hugs and enthusiasm. Let everyone think what they want about him, but I know what he really is about. Have a bang up season and kick the Dodgers’ butts. I really don’t care anymore. And good bye to Alex Wood who will always be a favorite. I will still treasure that jersey that I wore every time he pitched. And there goes would be back up catcher Kyle Farmer. Not sure what that was about. And getting Pollock is a good thing? Only if he plays as well WITH us as AGAINST us. And that probably means there will be no Bryce Harper in our future. I’m going to Fan Fest with Norma. We always have a great time. She’s getting selfies with Max and Chris with me and autographs with Steve Yeager and David Freese. I wasn’t going to go to Spring Training either. But I think I will since Russell Martin is back. If everyone remembers, I bought my blue car in 2008 on Russell’s birthday and its original license said ❤ RUSL55 until it was stolen from the Dodger Stadium lot the year he was traded. I then got the license plate ❤ DRE16 which it still is today. Hope to see everyone at Fan Fest on Saturday. It starts at 10:00am. The event is free. It’s always fun. I have not been this devastated over a trade as I have with this one involving my faves: Kemp, Wood, Puig and Farmer. Last time they traded Kemp, I almost gave up my season tickets. I have realized by now that baseball is purely a business. Apparently there is no room for believing that the team is your Dodger family. My heart is breaking but there is no place in baseball for attachments to any player. No one is exempt. I remember a few years ago I came to opening day and didn’t recognize most of the guys on the field. Good bye again to my heart and soul Matt. We had a fun season…. And please don’t lose that caring spirit of yours Yasiel. No one realizes how much of your heart you gave to the kids. You certainly didn’t do it for the publicity. I’ll miss your yearly poker tournament to benefit the kids. Love you so much. So Christmas will not be so jolly. My heart is torn apart. Thanks a lot Dodger owners. Baseball season is over. The next few empty months loom ahead of me. Spring Training seems very far away. Fan Fest is still two months away. There are several thoughts going through my mind. I’m forever grateful that Clayton has decided to stay with the Dodgers. I seriously had my doubts that he would leave the only team he has ever known. I’ve followed him his entire career and have seem him develop into one of the finest human beings ever. I knew that money wouldn’t send him to another team as it did Zack Greinke. I also have noticed that he has a set routine every game. Do you remember when the game didn’t start exactly on time when the other pitcher and manager walked across his path? He had a complete meltdown. That’s typical Clayton. I just couldn’t see him starting with another team. He has many charities going in Southern California along with Kershaw’s Challenge in Africa. I think he will be a Dodger for life. There always are changes in staff. Usually there are huge changes in the team. Manny Machado seems to be headed to the Phillies. I always did like Manny no matter how down the media and fans are toward him. I can only say that he was ALWAYS nice to me. he always gave me special attention even to the point he would stand in front of me and pose for pictures before every game. At first I thought it was my imagination but he would stop right in front of me while I took pictures. He would often look right at me and freeze in position while I took a shot. None of my pictures were ever blurry because he would throw in slow motion. And when I took a selfie with him, he had the sweetest smile. By the way, he took this selfie for me. The Manny I know…thank you for the autograph. After several months…I did ask him to sign a ball for me. He looked surprised. Maybe because I don’t get autographs anymore. The ball had been in my purse unsigned for most of the season. He almost looked grateful. Maybe he thought I didn’t like him. He would stop everyday in front of me waiting. If you can look at these pictures I took of him and still not like him, whatever. So when people speak evil of him, I can only shake my head and say “But you never knew him like I did.” Good luck to you Manny. You will always be one of my favorites. I’m sad to see my very favorite Chris Woodward leaving the fold. It is a good move for him since he will now be the Rangers new manager. I will miss his wonderful supportive wife trauma nurse Erin. Good luck to him and his family. My pictures won’t be the same without him blocking my view. And Turner Ward will have to be kissed by another player since he is going to the Reds. It is a good move for him too since he will be closer to his family. Godspeed Turner. Puig will miss you. I always can count on the Dodgers to be ignored during awards season. Even though they did go all the way to the World Series for the second year in a row, there was not one single Golden Glove award. Although Puig made all those spectacular catches and played excellent defense, once again he was ignored. Walker Buehler is up for National League MVP. If he doesn’t get it, I totally give up on all those idiots who vote or decide. My opinion about the World Series. MEH. These guys walked right past me, actually brushed against me. Whatever. Not impressed. I won’t make any negative comments because I’m not like that. I wasn’t as down on Dave Roberts as all the other fans were during the games. That being said, bullpen choices and Kenley pitching two innings in the final two games were beyond not good. The Dodgers should have won more than 1 out of the final 4 games. The Saturday game? I’ll never speak about that again. I will miss my Dodger friends. They are what made the season best. What can I say about the most wonderful folks on earth? I love you guys!! Lately I’ve been taking care of a new addition to the family…my new kitten Poppy. She is a handful but will keep my mind off the huge emptiness in my life with no baseball. Thanks everyone for following me during baseball season. I appreciate all your support and words of encouragement. I still have a lot to say about the World Series but thought it would be best to let everything settle first. Last of all…Dodgers..I’m proud of all of you. Two World Series in a row. What can I say? Not many fans can say that they have even attended one World Series game. I went to all of them. No matter what the final outcome…you are the best. Austin..I love you. My ST jersey is washed and ready to go for Spring Training. See you all soon. Thanks for stopping by. I’ll post often and keep you informed of what is happening. Dave Roberts is on the verge of signing a long term contract. Winter meetings are in the future. Will Ryu be signed again by the Dodgers? He wants to stay. More news coming.